Find the right storage for all of your needs when you shop with us at New Deal Metal Buildings in Denham Springs, Louisiana. Our selection of decorative portable wood buildings includes a wide variety of options for clients around the country. 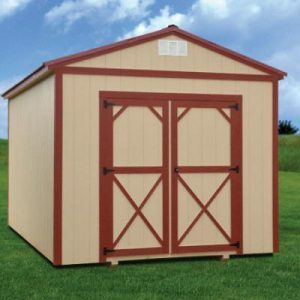 When you are looking for a cost-effective solution for your storage needs, visit us for our wooden sheds and other decorative architecture products. 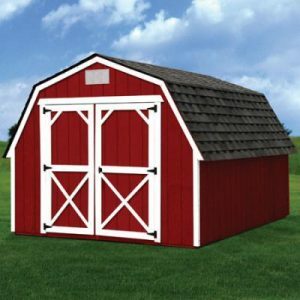 When you are looking for a cost-effective solution, choose The Barn for top storage. This model is available in 8′, 10′, and 12′-widths (14′ & 16′ width available in some areas). Standard features include a single wood door in the 8′-wide, and a double wood door in larger models. Please note that windows are not included with this model. The Deluxe Cabin is stylish and practical for any use. 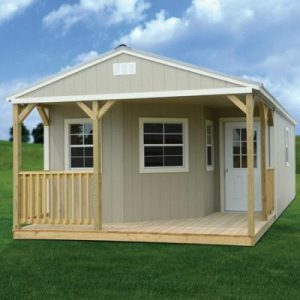 It is available in 10′ and 12′ widths with a gable style roof (14′ and 16′ widths available in some areas). Features for all models include a 36″ 9-lite door, 3-2’x3′ windows, and a wraparound 4′ front porch. The standard extra high walls make it an ideal solution for a small office or playhouse. The Cabin is stylish and practical. 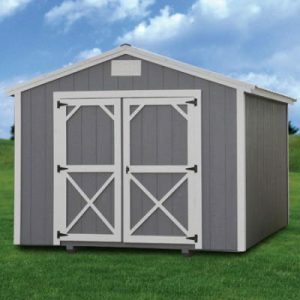 It is available in 8′, 10′, and 12′ widths with a gable style roof. Features for all models include a 36″ 9-lite door, 3-2’x3′ windows, and a 4′ front porch. The standard extra high walls make it an ideal solution for a small office or playhouse. 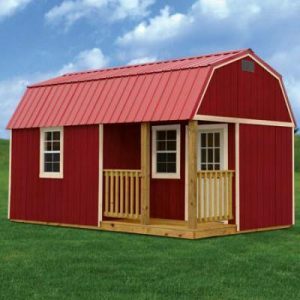 The Lofted Barn Cabin is available in 10′ and 12′ widths. It combines the best features of the lofted barn and cabin. All models feature a loft, extra high walls, a 9-lite door, 3-2′ x 3′ windows, and a front porch. 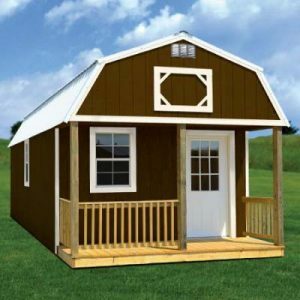 The Deluxe Lofted Barn Cabin is available in 10′ and 12′ widths. It combines the best features of the lofted barn and cabin, but with 3 windows and a wraparound porch. All models feature a loft, extra high walls, a 9-lite door, 3-2′ x 3′ windows, and a wraparound front porch. The Lofted Barn is our most popular barn. It is available in 8′, 10′, and 12′ widths (14′ & 16′ available in some areas, based on hauling restrictions). The 8′-side model features a single wood door, while the larger models include a double wood door. All models come with a convenient loft that provides additional upper storage. Please note that windows are not included with this model. 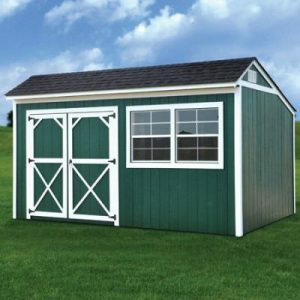 The Utility model features the industry standard gable roof. It is available in 8′, 10′, and 12′ widths. It comes standard with 6′-3″ walls and can be purchased with the optional extra high 7′-8″ walls. The 8′-wide models features a single wood door, and larger models include a double wood door. Please note that windows are not included with this model. 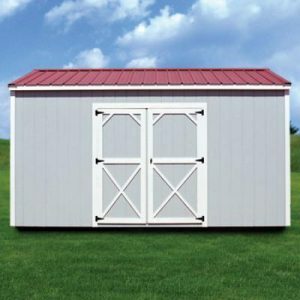 The Utility Extra Height model features the industry standard gable roof. It is available in 8′, 10′, and 12′ widths (14′ & 16′ widths available in some areas, based on hauling restrictions). It comes standard with extra high 7′-8″ walls. The 8′-wide models features a single wood door, while the larger models include a double wood door. Please note that windows are not included with this model. 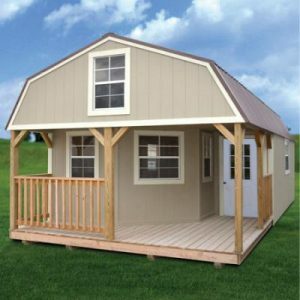 The Side Utility model features the industry standard gable roof and side entry. It is available in 8′, 10′, and 12′ widths (14′ & 16′ widths available in some areas, based on hauling restrictions). It comes standard with extra high 7′-8″ walls. The 8′-wide models features a single wood door, the larger models include a double wood door. Please note that windows are not included with this model. 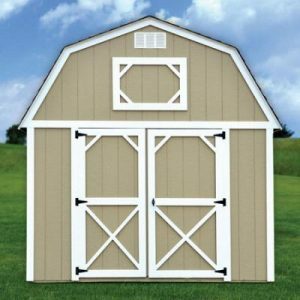 The Side Lofted Barn is available in 8′, 10′, and 12′ widths (14′ & 16′ widths available in some areas, based on hauling restrictions). The 8′-side model features a single wood door and 1-2×3 window. The larger models include a double wood door and 2-2×3 windows. All models come with a convenient loft that provides additional upper storage. 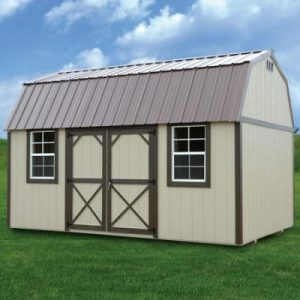 The Cottage Shed features a traditional saltbox roof and is available in 8′, 10′, and 12′-widths (14′ & 16′ available in some areas, based on hauling restrictions). The 8′-wide features a single wood door and 1-2×3 window. The larger models include a double wood door. The windows in the larger widths vary by the length of the side. 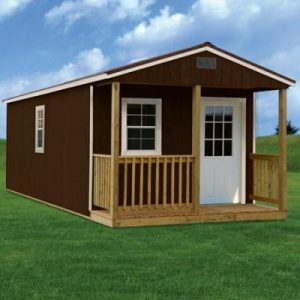 The Side Lofted Barn Cabin is available in 10′ and 12′ widths (14′ & 16′ available in some areas, based on hauling restrictions). It combines the best features of the lofted barn and cabin. All models feature a loft, extra high walls, a 9-lite door, 3-2′ x 3′ windows, and a side porch and entryway. 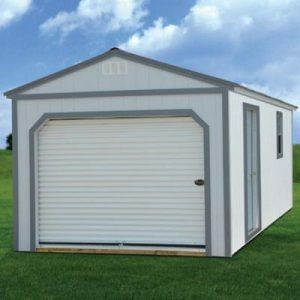 The Garage comes in a standard 12′-width with two lengths to choose from: 24′ and 32′. The garage is design includes the extra high walls. All models feature a 9′ x 6′-6″ roll up garage door, one metal door, and 1-2′ x 3′ window. It is an ideal large storage solution.